Bernard Howell Leach is considered the most influential potter of the twentieth century. He left an irrefutable mark with his writings, teachings, prolific work in clay, and contributions at the potteries he established. Among his many accomplishments, Leach is credited for merging Eastern and Western craft traditions and for elevating utilitarian pottery to an art form. In the United States during the latter half of the twentieth century no one had a greater impact on American ceramics than Leach. Within the Kamm Teapot Collection, there is a Leach teapot as well as two Hamada teapots and a tea bowl. There are also numerous works by American artists who were influenced by these masters. Karen Karnes, Mark Hewitt, Randy Johnston, Val Cushing, and, of course, Warren MacKenzie are just a few of the many. Warren MacKenzie and his wife Alix are particularly important when examining Leach’s impact. After reading A Potter’s Book, they traveled to St. Ives to learn from Leach. They were the first Americans to make this pilgrimage, apprenticing for two and a half years. Throughout his career MacKenzie produced functional wares that observed the “mingei ideals of truth to materials and beauty of repetition.”[xxvii] He “[used] sheer volume to lose himself in the work.”[xxviii] MacKenzie taught for thirty-seven years at the University of Minnesota sharing his knowledge and the concepts he learned from Leach with generations of students. Bernard Leach lived a full life continuing to produce work until 1972. 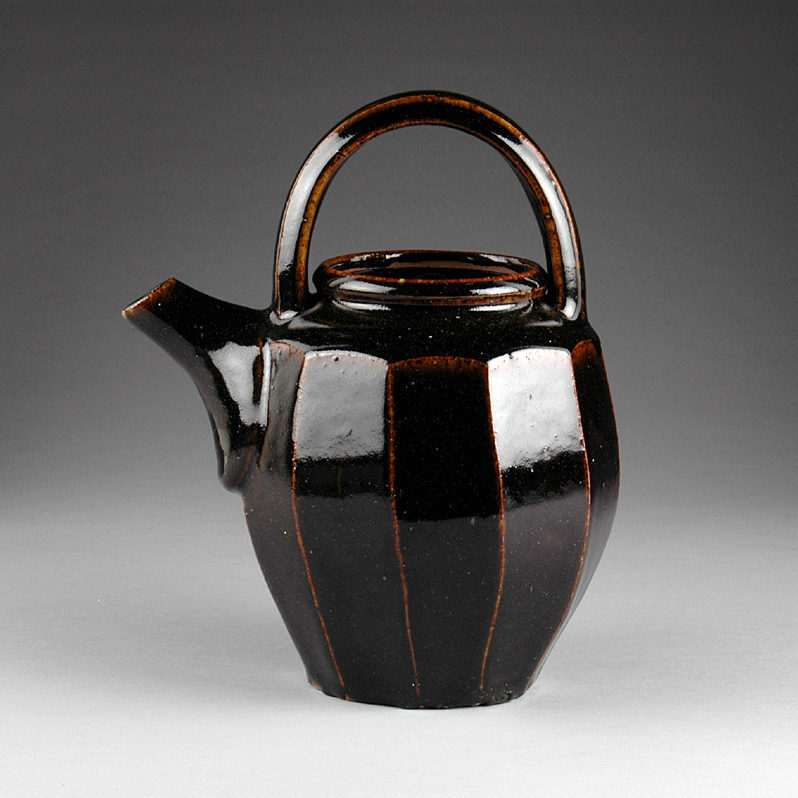 Leach and his philosophies are embedded in the development of modern ceramics, especially in the United States. Among the many honors bestowed upon him, Leach was made a Commander of the Order of the British Empire (1962) and he received Japan’s Order of the Sacred Treasure, Second Class (1966). The Leach Pottery in St. Ives is still open today. Cooper, Emmanuel Cooper. Bernard Leach: Life and Work. New Haven and London: Yale University Press, 2003. Rice, Paul. British Studio Ceramics. Wiltshire, England: The Crowood Press, 2002. De Waal, Edmund. Bernard Leach. London: Tate Gallery Publishing, 1998. [i] Garth Clark, ed., Ceramic Art Comment and Review 1882-1977, New York: E.P Dutton, 1978, 86. [ii] Leach’s mother, Eleanor Sharp, died not long after his birth. After her death, he lived with his maternal grandparents in Kyoto, Japan. Once his father, Andrew Leach, remarried, he lived in China and Singapore with him. Leach’s dad died in 1904. Leach attended Beaumont College in Old Windsor, Berkshire, England in 1897. [iii] Leach attended the Slade School of Art in London (1903) followed by the London School of Art (1907). [iv] Leach brought with him from London a small etching press. [v] Raku is the art of making low-fired earthenware ceramics. [vi] Emmanuel Cooper, Bernard Leach: Life and Work, New Haven and London: Yale University Press, 2003, 68. [vii] Urano Shigekichi or Kenzan VI (1851-1923) was an artist potter who worked in Kenzan pottery tradition. Leach and architect Kenkichi Tomimoto were jointly given the title of Kenzan VII. This was a rare honor for a Westerner such as Leach. [viii] In 1915 Leach moved to Peking, China briefly. [ix] His workshop in Abiko, Japan was on Soetsu Yanagi’s property. Yanagi convinced him to come to Abiko which was a kind of artist colony that attracted visual artists, writers and intellectuals. Aristocratic patron Viscount Kuoroda generously offered Leach a kiln in Tokyo in 1919. [x] Leach’s relationship with Japanese culture/pottery is often debated. Most scholars believe Leach helped found the Mingei movement in Japan and that he did not copy Japanese pottery. Instead, his pottery is inspired by numerous cultures and their ceramic traditions. [xi] Paul Rice, British Studio Ceramics, Wiltshire, England: The Crowood Press, 2002,19. [xiv] Leach’s family also returned to England in 1920. While in Japan Leach married his cousin Muriel Hoyle and had children. His sons Michael and David would become potters as well. 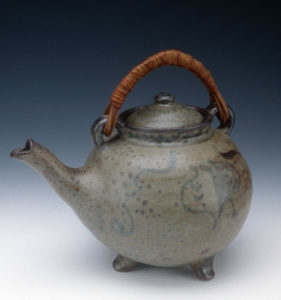 There is a teapot by David Leach in the Kamm Teapot Collection. Leach returned to England with an invitation from Frances Horne. Horne was establishing a Guild of Handicrafts within the artist colony in St. Ives and was searching for a potter. [xv] In St. Ives Leach and Hamada built an Asian climbing kiln for high temperature firing, the first of its kind in the West. Also, they set up a small round updraft kiln for earthenware and oxidized raku which introduced this technique to the West. Hamada’s technical knowledge and training in glaze chemistry played an important role in the development of the pottery. [xvii] Kevin A. Hluch, The Art of Contemporary American Pottery, Iola, WI: Krause Publications, 2001, 55.
century. Also, important was Zen Buddhism and the traditions associated with the Japanese tea ceremony. Herring, 14. [xxii] Leach, Hamada, and Yanagi also visited Hawaii during the 1952 trip. [xxiii] Mark Tobey and Leach met in the early 1930s at Dartington Hall in Devon, England. Tobey was a believer in the Bahá’í Faith. Leach would also become a practising Bahá’í.